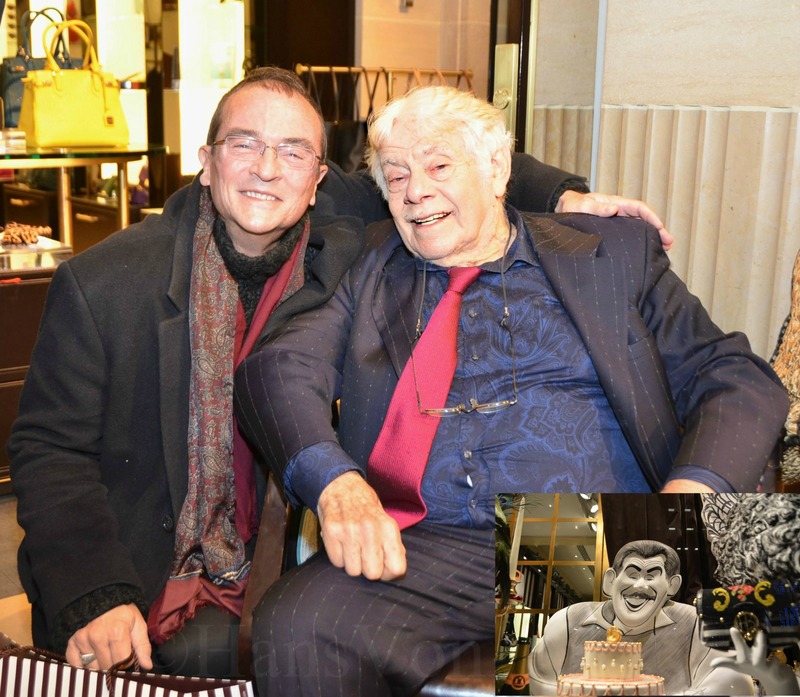 Photo of the day: MY EVENING WITH FRANK COSTANZA/JERRY STILLER – Last night the upscale department store Henri Bendel’s Christmas windows were unveiled revealing a tribute to the greatest caricature artist of all time and one of the greatest artists ever – Al Hirschfeld. Bendel’s Christmas window revealed the ultimate fantasy gathering for Christmas dinner with some of the most famed New York personalities, Jerry Stiller among them. After some glasses of champagne and discussing today’s TV shows “our show is better than that vampire crap today!” said Stiller, I asked Frank Costanza, er, ah, Jerry if we could pose for a few photos together, this is my favorite. More of the event to follow. This entry was posted on November 15, 2013 by newyorkcityinthewitofaneye. It was filed under DAILY PHOTOS WITH STORIES OF NEW YORK CITY and was tagged with Al Hirschfeld, arts, celebrities, entertainment, Frank Costanza, George Costanza, Hans Von Rittern, Henri Bendel, Henri Bendel department store, Jerry Stiller, Manhattan, Margo Feiden, Margo Feiden Gallery, New York Christmas windows 2013, New York City, Photo of the day, photography, Seinfeld TV series.